Attach a PropElement component to any object to make it act like a prop that you can pick up. Gravity (On/Off) - Control whether the object has gravity applied to it or whether it should float in the air. OnBeginInteraction - The user picked up the object. OnUseButtonDown - The user pressed the trigger button while holding the object. OnUseButtonUp - The user released the trigger button while holding the object. OnEndInteraction - The user let go of the object. OnCameraActivated - Do something when the camera is activated in the Flipside camera switcher. OnCameraDeactivated - Do something when the camera is deactivated in the Flipside camera switcher. OnEnter - Do something when an object enters the collider's volume. OnExit - Do something when an object exits the collider's volume. You can also limit whether the events on a ColliderElement should trigger for Everything, only a user's Hands, only a user's Index Finger, a specific Object List, or only objects with a Custom Tag (see CustomTag below), to create larger or more fine-grained interactions. Attaching a ToggleElement instead of a ColliderElement works the same way but keeps track of its on/off state so you can do things like turn a light on/off with repeated button presses. InitiaState (On/Off) - Control whether it should start in an Off (default) or On state. OnActivated - Do something when the element enters its On state. OnDeactivated - Do something when the element enters its Off state. All other options are identical to ColliderElement. 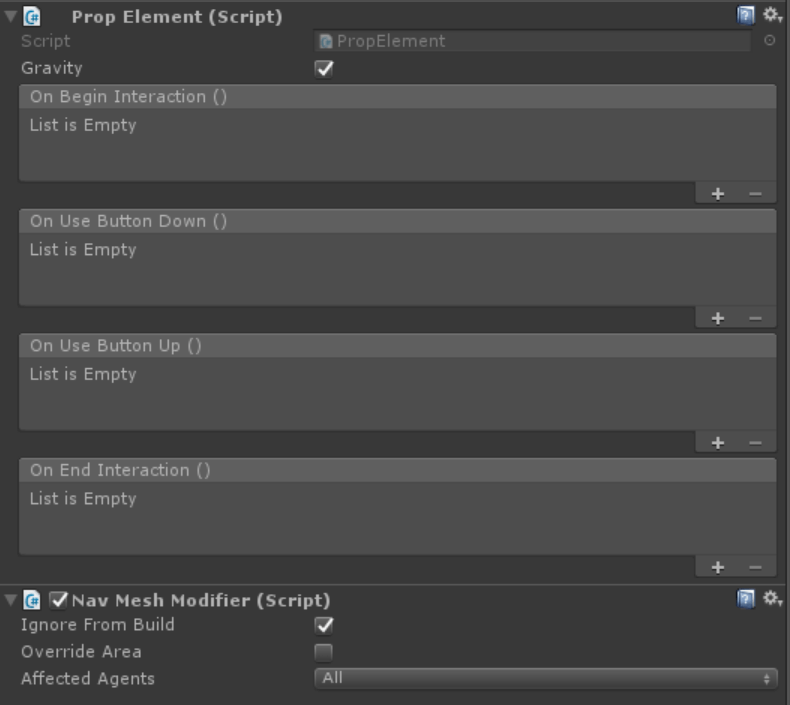 To use it, attach FlipsideActions to an object in your Unity scene, then drag that object into the Unity event in the Inspector window and select the action you want to trigger. Lets you specify a custom tag to limit ColliderElement interactions to specific types of objects only. Tag values can be anything you choose. To use, attach this component to an object and assign it a custom tag of your choosing in the Inspector window, then set the Custom Tag option in ColliderElement and ToggleElement components to match.